To summarize so far, in Chapters 1-3 we saw that the basic purpose of these first three chapters was to encourage the Church, then and now, to persevere and remain faithful to God's Word while waiting expectantly for the Lord's return. 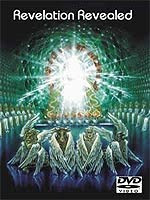 In Chapters 4-5 we read about John experiencing a rapture when he was transported from Earth to the Throne Room of God. And, we read about how he received assurance that God is on His throne and in complete control, orchestrating all the evil of mankind to the triumph of His Son, Jesus. Then, in Chapter 6, we encountered the beginning of the seven years of Tribulation that will bring the Church Age to a close. We discovered that one-fourth of humanity will die in the opening years of the Tribulation as the Antichrist launches a war to conquer the earth. And, when we last looked at Chapter 7, we discovered it is an interlude chapter designed to encourage the reader. It indicates that 144,000 born again Jews will evangelize the world, resulting in a great harvest of souls, most of whom will die as martyrs for Christ. We'll continue on in our journey through the great book of Revelation next by reeling from six of the seven horrific Trumpet Judgments of Chapters 8-9. Feel free to watch, listen, or read along by clicking one of the icons below. David Reagan: With Chapter 8 the action resumes with the pouring out of the second series of judgments upon mankind — the Trumpet Judgments. We're still in the first half of the Tribulation, and God's judgments resume. It says there is silence in Heaven for half an hour. It's as if all of Heaven is holding its breath before the pouring out of another series of terrible judgments. Beginning with Revelation 8:7, the Trumpet Judgments begin to fall very quickly. They begin with hail and fire mixed with blood being thrown down to the earth. And incredibly, one-third of the earth is burned up and one-third of the earth's waters are polluted. Until recently, most commentators interpreted these Trumpet Judgments to be supernatural acts of God, and you know, they could be. However, when God pours out His wrath He often does so by relaxing His restraints on human behavior, unleashing people to destroy themselves. This process is clearly outlined in Romans 1, where we are told that when a society rebels against God and refuses to repent, the Lord will step back, lower His hedge of protection, and allow evil to take its course. I believe God's restraining hand is the only reason nuclear weapons have not been used since World War II. And, speaking of nuclear weapons, I think it is significant that we are the only generation that has ever lived that has the capacity to bring upon ourselves the enormous destruction described in Revelation. This is due to the development of nuclear weapons and intercontinental ballistic missiles. The power of these weapons is absolutely breathtaking! For example, one nuclear submarine today carries more firepower than all the bombs dropped during World War II. I believe Chapter 8 is a first century man's description of a nuclear holocaust. Verse 12 says that one-third of the light of the sun, moon and stars is blocked out. That is exactly what would happen in a nuclear holocaust, because so much debris would be sucked up into the atmosphere by the explosions. The dense cloud that would be produced would cause temperatures to plummet below freezing all over the world, causing many people to freeze to death. That same cloud would be carrying nuclear radiation, which is probably the reason that we are told in Revelation 16:2 that by the end of the Tribulation people's bodies will be covered with sores that will not heal. In short, after the nuclear holocaust described in chapter 8, the living will envy the dead. Jesus himself may have been referring to the age of nuclear weapons when He declared that one of the characteristics of the end times would be, "Men fainting from fear over the expectation of the things which are coming upon the world; for the powers of the heavens will be shaken." David Reagan: The Trumpet Judgments continue in Chapter 9 with a plague of demonic locusts. They inflict a sting that causes people to suffer so terribly that they long for death, but they cannot die. Their torment continues for five months. The locusts are empowered to inflict their suffering upon all people except the 144,000 Jews who have been sealed by God. When the Sixth Trumpet is blown, an army of 200 million is let loose. This terrible scourge proceeds to kill one-third of those left alive after the Seal Judgments. Combined with the one-fourth of humanity that died in the war of the Seal Judgments, this means that one-half of the world's population will be killed in the first half of the Tribulation. That's more than three billion people in today's terms! I believe this army of 200 million is the same as the one mentioned in the book of Daniel where it states that an army will march against the Antichrist from the east. Daniel says that when the Antichrist hears of this army, the news will greatly disturb him and he will retreat to a place "between the seas" where he will prepare to confront the army. That place, between the Sea of Galilee and the Mediterranean Sea, would be of course the Valley of Jezreel, or the Valley of Armageddon as it is called in Revelation 16:16. I believe the passage in Daniel indicates that the nations of Asia will revolt against the Antichrist. As they march across Asia, they're going to slaughter one-third of humanity. And, when they reach the Euphrates River at the end of the Tribulation, it will be dried up to allow them to cross into the valley of Armageddon where they will attack the armies of the Antichrist. That's when the Lord will return. Chapter 9 ends on a very sad note. We are told that despite the unparalleled carnage of the Trumpet Judgments, "The rest of mankind, who were not killed by these plagues, did not repent of their works of their hands, so as not to worship demons and the idols and they did not repent of their murders, nor of their sorceries, nor of their immorality, nor of their thefts." At this point in the Tribulation, it's as if man is shaking his fist at God. As Billy Graham has often said, "The same sun that melts the butter hardens the clay." The Gospel sometimes melts hearts and sometimes hardens hearts depending upon whether or not the person is willing to receive the message. The same is true of the judgments of God. In the next part on this series on Revelation, God in Chapter 10 gives the reader assurance that everything is going to work out all right, then we'll be introduced to the mysterious Two Witnesses of Chapter 11.
the end time sins in rev 9:21are very prevelent today indicating the time is near.